Dear friends, I'm from Spain, sorry for my English. I have a problem with my SONY VO-8800P portable u-matic so player, because I play a tape and apears in black&white and without sound. I don't know if there are a incompatibility problem between player/tape. I am after around a dozen 7 pin Y/C Dub Cables that were used by most of the Broadcast U-matic machines back in the day. Hi - I currently have a couple of refurbished U-Matic VTR's available for sale. All are in full operational condition and very good physical condition. Please let me know if you are currently looking for any. Hello, I will introduce myself. I have been working in professional video for more 40 years, I live in Argentina. I arrive to this site looking for a Sony manual, and I found this interesting U-matic user chat. I will try to help some questions. Regarding U-matic cassette cleaning machines, they were not manufactured many years ago, so in order to reproduce a tape 30 years old, it is essential to clean it before play. At the moment I am digitizing about 800 tapes from an international production company, for which I had to manufacture synthetic suede pads to clean with isopropyl alcohol and also dry as the cleaning proceeds on both sides of the tape. 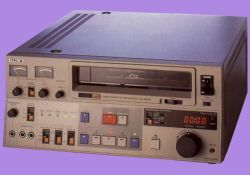 Also, over time some tape marks often get stuck inside the case, for which it is necessary to copy the tape with the cassette disarmed and without the front loader of the VCR. In the event that the tape has lost the degree of softness necessary to avoid sticking to the drum heads, I give less tension to the tape brake guide using a micro servo with manual adjustment, so that the tape is released from the Brake. It is important to clean the audio heads and track control, to achieve clean audio. In my case, the audio enters an equalizer to eliminate the typical blowing of the tapes. When in some cases the heads are dirty and the gap is covered, clean them with a printer paper imbibed in isopropyl alcohol, supporting their very soft over the drum in clockwise. Any doubt I will try to answer it if I know the answer. I am trying to track down a Service Manual for the following Time base Corrector , a FOR.A FA310P, to purchase, or have the relevant pages ie Circuit Diagram and Block Diagram etc , copied. Also does anyone have any details regarding the High Band Mod Kits for the Sony VO-58XX Series Machines? I'm currently looking for something able to read U-Matic tapes. Does everyone have on available or know where I coud get one ? I can transfer U-matic (PAL) tapes if you were interested. I am in the UK. Hello everybody, i work with a rock band in chile, they live and play in europe 77 until 84. In Holland play with shynphonic and they tall me about the shoot this concert...but...in 3/4 (umatic) pal OPEN REEL...is possible this format? year of shoot 1980.
i need transfer this tape (only i know this information... i dont have the tape)...really exist this class of tape? 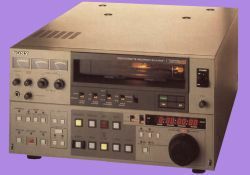 I am looking to purchase quantity 8 BVU-950 U-Matic VTR with TBC preferably. I am also looking for useful spare parts for the above. Please email me on [email protected] with info and offers. I am currently looking for a U-Matic tape cleaning machine. Does anyone have one available for sale or know where I could get one. I have a Sony VO 9800 Machine available for sale. The machine has been refurbished and is ideal for archive work.Please let me know if you are interested in this machine. Sorry, both Umtaics mentioned in previous post, taken now. Sent to a good home. I have two Sony Umatics I don't need anymore. 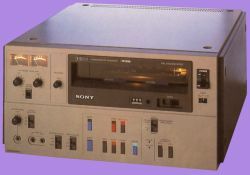 A Sony Umatic SP VO9800P Pal and Sony VO5630 Pal/NTSC/Secam. Both work. Don't want any money for them, just want to see them go to an appreciative home. I live in Surrey in the UK. Pleae email if interested. Have you tried Ray Purnell? 0418 468 394, he is based in Artarmon. I'm looking to purchase a Sony (U-matic) DMR 2000 drum assy. I'm located in Sydney Australia. Sorry all. I accidentally placed my ad on the wrong site. Betamax instead of umatic. I have a whole studio full of umatic low band video gear. 4 players, a recorder/ playback machine plus a pair of recorder/ players as an edit suite complete with control unit editor. Several high quality studio cameras plus outside cameras. Tripods and trolleys, machine stands on wheels, microphones and stands, cables etc. I just need the space so am open to any reasonable offers for any or all of the gear which is all in good condition. I also have about 70 reels of umatic tapes both 20 min and 60 min sizes. I am based in COLCHESTER, East Anglia and can be contacted any time on :- 01206 760700 or by email as above. The drum meter is about 200 hours. It works perfectly except one thing : The tape rewind is very slow. FF works perfectly. So what's wrong ? How to fix it ? I've another question : Can you give me brand and reference of lubrication o�l for VCRs like U-Matic. I�m looking for a U-Matic Tape Cleaner. Does anyone know where I can get something like this? I'm from Germany.